Educational materials developed by the ADS cover the following topics: Acute Respiratory Infections, Alcohol Use Disorder, Antipsychotics, Benzodiazepines, Chronic Insomnia, Dementia, Depression, Emergecy Department Acute Pain, Headaches, HIV/PrEP, Opioid Overdose Education and Naloxone Distribution, Opioid Use Disorder, Pain/Opioid Safety Initiative, Post-Traumatic Stress Disorder, and Schizophrenia, Stimulants, Suicide Prevention, and VA Video Connect. Topics identified and developed undergo extensive review by subject matter experts, identified topic aligned committees, and PBM Clinical Pharmacy Program Managers. All subject matter experts are required to complete conflict of interest forms. All of our Academic Detailing Educational Materials are available through our Educational Material Catalog, which can be accessed by clicking on the first image below. Every item listed in the Catalog can be accessed by clicking on its corresponding image within the Catalog. We also provide a catalog of educational materials specifically on Pain Education, which can be assessed by clicking on the second image below. 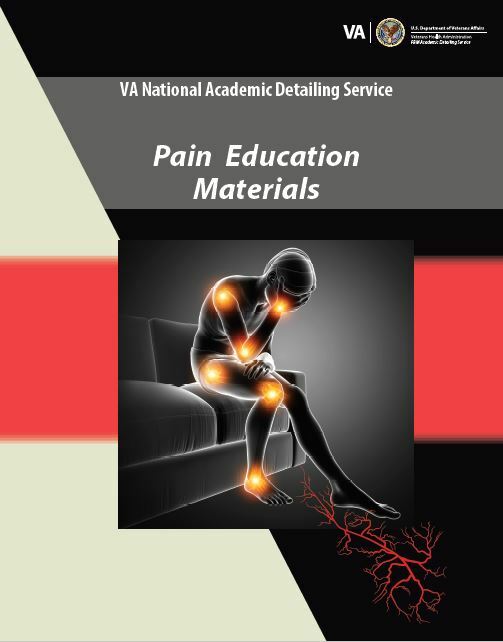 The Pain Education Materials Catalog highlights materials that will specifically be helpful to providing academic detailing for providers managing patients with conditions related to pain. Document utilized to guide discussion between the Academic Detailer and the clinician. This document provides visually pleasing summaries on updates of the literature and guidelines for the topic being addressed. It typically includes a combination of text, tables and graphics to illustrate information and provide support for key messages. Document containing key drug (e.g. drug dosing, monitoring) and non-drug detailed information needed to carry out key messages identified in the provider guide, such as information on side effects, dosing, lab monitoring, and interpretation of results. Two page quick reference document utilized to provide additional information to support specific key messages. Documents used to facilitate shared decision making, to engage a patient in a particular topic and encourage them to talk to their provider, or to advertise a particular treatment option or assessment tool. ***Disclaimer: These resources are designed for an Academic Detailing Program. These are not instructions for the patient. Please ensure the patient speaks with their provider to determine what is in the best interest of the patient.